The 8 Core Skills basically consist of sets of opposite actions - Open/Close, Stretch/Compress, Twist/Release. The one exception is the first skill - ‘Soften & Connect’ in which the two actions function more like fusion rather than fission. These skills are actually part of the Nei Gung system found in genuine Taijiquan (as well as the other Internal Martial arts like Bagua, Liu He Ba Fa and Xing Yi.) Once mastered, these skills become the physical motivation/delivery system for the transmission of the various compound bio-electromagnetic energies, in other words, the different types or forms of Qi. Of all the 4 sets of skills, the first one, Soften & Connect is by far the most important and here’s why. Without the ability to connect and unify the entire body as if it were one big piece, whole body movement movement simply isn’t possible. Also, and perhaps even more importantly, hidden within the first Core Skill is the royal highway which eventually leads to SUNG or SONG. Once a relative degree of Sung is achieved, then and only then does it become possible to competently execute the other Core Skills. 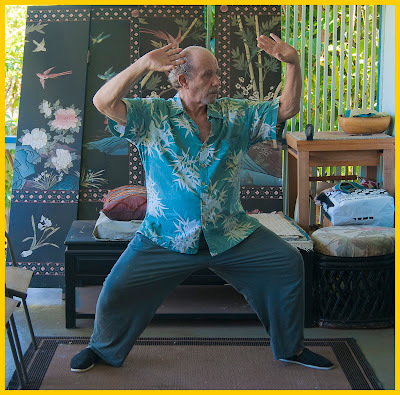 This achievement (the acquisition of Sung) is the first threshold or gate through which each practitioner must pass in order to be able to apply the over 40 types of Jing available in Taijiquan applications. So what is Soften & Connect really? Well, for one thing it is the primary modus operandi (method of operation) of Zhan Zhuang, Standing Meditation. Soften & Connect or more accurately RELAX, Soften & Connect is what begins to happen during a Zhan Zhuang session if we go about training correctly. In order to do this we start with the most exterior parts of the body and then gradually progress inward until we include the deepest structural muscles, tendons, ligaments and bones, We are especially interested in making contact with the sinews having to do with the spine and each of the spinal vertebra. These tissues hold the spine erect as well as allow it to extend and compress as well as to twist and fold. Let’s take the upper back as an example. Please note that this procedure is actually rather complicated when viewed mentally. But if we hold to our center as is recommended during Zhan Zhuang meditation, the body itself will help facilitate many of these connections and unifications. So we start with the most superficial muscles of the upper back. These will include the Trapezius, Infraspinatus, Teres Major and Minor and the Deltoid. After relaxing these muscles in order to ‘soften’ them, we then must proceed to the next deeper level. These muscles include the Levator Scapulae and the Rhomboids, Major and Minor. For a still deeper level we must finally add the Intercostal muscles. (The muscles connecting the ribs to each other and in part to the spinal vertebra. Realistically, this procedure must then be applied throughout the entire body, from head to toe. And this is just the muscles. From there we must become acquainted and work with all the tendons and ligaments. Deeper still we encounter the bones themselves as well as the bone marrow housed in the center of each. At the same time we become aware of the bone marrow deep within the bones, we may also become aware of our Zhang Fu or the Internal Organs. This will also include the brain and the glands. Of course this accomplishment generally takes many years of dedicated and correct practice. The idea of the ‘connect’ part of Relax, Soften & Connect is a little more difficult to explain. Of course physically the muscles do not actually alter their shape or anything, other than what happens when the muscles naturally relax their tension and ‘soften,’ but energetically something very different happens. We literally begin to feel that more and more of our muscles and muscle groups are somehow joined or fused to one another such that when we breath or move, all our muscles function simultaneously, in unison as though they are one complete unit - like a single-celled biologic or in Taiji like a big round ball moving. And of course this... is Sung! In the next installment we’ll examine the other 3 pairs that make up the remainder of the 8 Core Skills and how they work and also how to train them both for inclusion in a Taiji form as well as for martial application.